After purchasing a new yacht, or deciding to spend the Summer elsewhere in the world, chances are in either scenario, a qualified yacht transport company will be needed to get the job done. There are many choices in this industry, but there are very few options when it comes to working with the best. United Yacht Transport would like to explore why working with us is such a positive and powerful experience. Here are the top five reasons to work with us for yacht shipping worldwide. 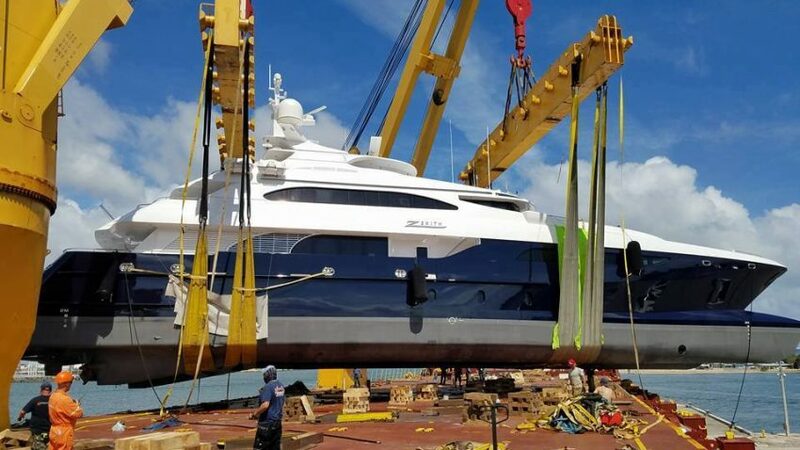 The ability to transport large watercraft across oceans is not the only experience that mariners should seek out when transporting their yachts. At United Yacht Transport, we have layers of experience from logistic personnel to quality care shipping processes. We’ve spent years designing systems for moving boats and yachts to ensure they are delivered in the same condition when we received them. Our clients travel the world and want to do so on their very own yachts. United Yacht Transport services worldwide destinations so clients can enjoy new waterways on their private vessels. We support destinations such as the South Pacific, Mexico, Caribbean, Mediterranean, and the Pacific Northwest. Our experience working with sizeable marine shipping and receiving networks give our customers peace of mind that their vessels are in the right hands. Part of what makes United Yacht Transport unique is that we offer regularly scheduled voyages to major worldwide boating destinations. Likewise, our team can also put together customized voyages for those who have more unique destinations in mind. Since we use large-scale carriers to transport watercraft, it allows us to offer competitive rates to popular destinations, spreading out fuel costs among a larger group of yacht owners. With our custom voyages, customers work with a representative to get their vessels to more “off-grid” destinations such as The Maldives, islands of the South Pacific or even Antarctica. Almost anything is possible, so we urge new clients to connect with us to see how we can help them explore the world from their own vessels. Clients who need liner services outside of our regularly traveled ports can count on United Yacht Transport to serve that need. Our long-standing relationships with liner operators allow us an advantage to get vessels to areas we don’t necessarily service. Since we are a more significant player in the yacht shipping industry, we have tremendous purchasing power with our operators which translates into considerable savings to our clients. We work to make new relationships every day so clients have more options as to where their vessels can go. Getting started with us is easy, just simply reach out to our team or connect with us to get a quote. Our teams handle shipping logistics, clearance for ports of call and customs, marina slips at destinations, risk insurance and everything in-between. We are happy to answer any questions our customers have and work tirelessly to keep our clients informed and comfortable throughout the shipping process. If you’re passionate about boating, what could be more exciting than the Miami International Boat Show? But getting to the show, even if you live in Florida, might produce a bit of a challenge, and many first-time attendees who would like to bring their boat have never dealt with boat shipping. United Yacht Transport routinely transports to boat shows, and we have everything you need to know about how to enjoy your time at the show with reliable boat and yacht transport! What is the Miami Boat Show? Florida has great events for boaters from Fort Lauderdale to Miami. If you’re a new boat owner, or if you’re new to the area, you might have only recently heard about the Miami International Boat Show. 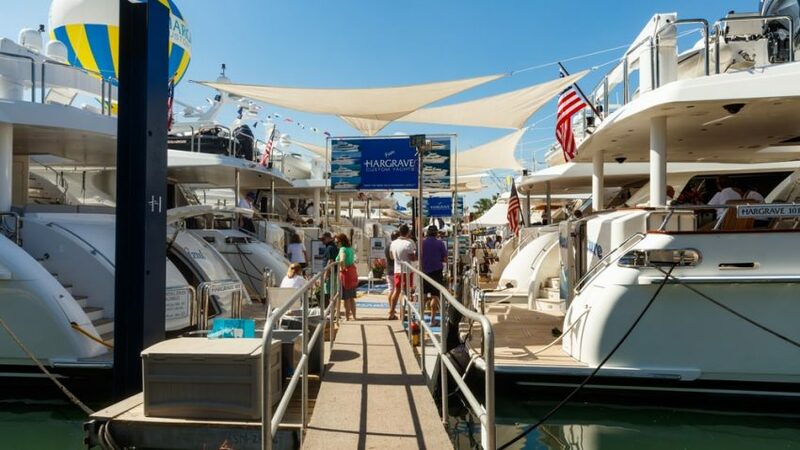 One of many events held annually in February, and produced by the National Marine Manufacturers Association in Miami, the event offers tons of activities for boaters and non-boaters alike. Featuring sailing exhibitors with live demonstrations, seminars for novices and professionals, racing, and of course tons of food and festivities, the Miami International Boat Show is a dream come true. But whether you’re participating or just want to bring your boat to the occasion, there are a number of obstacles you’ll face. Transporting a boat or yacht always presents a lot of challenges. Most people don’t have the necessary truck and equipment to haul their boat, let alone safely. There are many considerations, both logistical and technical, that a first-time hauler wouldn’t know, and you may need additional skills and certifications that you don’t already have. You care deeply about your boat and want to ensure that your investment is protected, so hiring a professional makes perfect sense. Of course, these issues are compounded when dealing with a massive urban environment like Miami, plus the highways on route to Miami. Navigating these varying areas with a haul, and dealing with the huge crowds—expect there to be many trucks hauling boats this time of year—creates a situation that can quickly become a frustrating disaster. United Yacht Transport routinely handles yacht transport and boat shipping to events around the world. As the largest yacht transport carrier worldwide, we have everything you need. We have a delivery captain, marina slips, custom clearance, top-notch crew and management, and all risk insurance. Don’t settle for a smaller company without the same level of experience or liability. 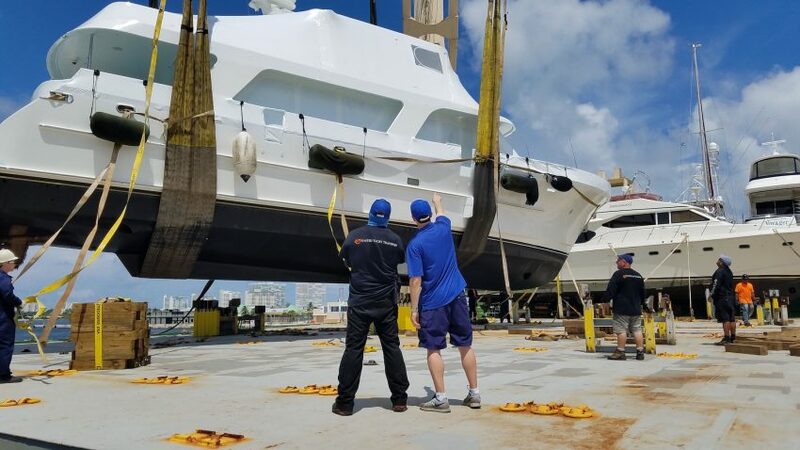 With countless testimonials from customers who’ve shipped their yacht or boat safely and effectively, United Yacht Transport is the reliable solution. Get your boat or yacht to the Miami International Boat Show, and focus on enjoying the festivities, rather than worrying about whether your boat is in good hands. Request a free quote from United Yacht Transport today, and let us walk you through the process of a safe delivery! The biggest boating event on the calendar is kicking off in Florida, and this year’s show is shaping up to be the very best one yet. If you’re passionate about yachting, boat design, yacht transportation, marine innovation, and everything to do with the water, then the Fort Lauderdale International Boat Show, aka FLIBS, is an event that cannot be missed. International designers, builders, dealers, and enthusiasts will all come together this Wednesday for the largest boat show in the world. Meet and greet with key figures in the industry, or even learn more about international boat shipping costs. There are attractions for the whole family, with on-water displays and more than 3 million square feet of exhibition space. The show opens on Wednesday at noon for the prime-time preview, with general admission running from Thursday, November 1, up until Sunday, November 4. Although aimed directly at boat enthusiasts and members of the industry, the Fort Lauderdale International Boat Show of 2018 has something for the entire family, even those who aren’t specifically interested in the latest marine craft and technology. More than 110,000 people come from all around the world to see the show, with 52 countries represented by exhibitors. Luxury cars including some of the world’s most exotic supercars will be on display, allowing you to see the bleeding edge of technology first-hand. The Blue Wild Ocean Adventure Expo is a yearly fixture at the Fort Lauderdale show, with keynote presentations covering topics ranging from underwater photography to spearfishing. Manny “Sharkman” Puig will be joining the Blue Wild team this year for his highly popular Savage Wild seminars. Even if you’re heading to the show with the sole intention of buying and shipping boats, you’ll find plenty of extras that make the experience that much more exciting. Catering will be provided throughout the show with options to purchase exciting food from Proof of the Pudding, a culinary provider focused on innovative menus and sustainability. Farm-to-plate food choices with organic ingredients are locally sourced and served in biodegradable packaging. This is the ultimate show on the calendar for buyers, dealers, manufacturers, or even if you are simply interested in the latest technology and want to meet and greet with key industry players. Kids attractions, a safe environment, and the world’s most beautiful watercraft will make this week very special. Personal craft from Sea-Doo and Yamaha, the latest scuba technology, day cruisers, high-performance power boats, skis, and wakeboards are just a few more examples of what you’ll find on display. Come and see what makes the show so popular, and maybe you’ll even finish the week off with a new purchase that is ready for yacht transportation anywhere in the world! With some of the most gorgeous yachts on display, you may find it hard to leave without opening your checkbook. More than 1,500 boats will be on display with 1,200 exhibitors in total. Famed designers and builders like Worth Avenue Yachts, Heesen, Oceanco, MJM Yachts, Carver, and many others will be displaying this week, and a significant amount of this year’s yacht sales will be completed at the event. If you’re exploring the market to purchase a yacht, or even if you’re a private seller or dealer, you’ll need an efficient yacht transportation company to take care of logistics. 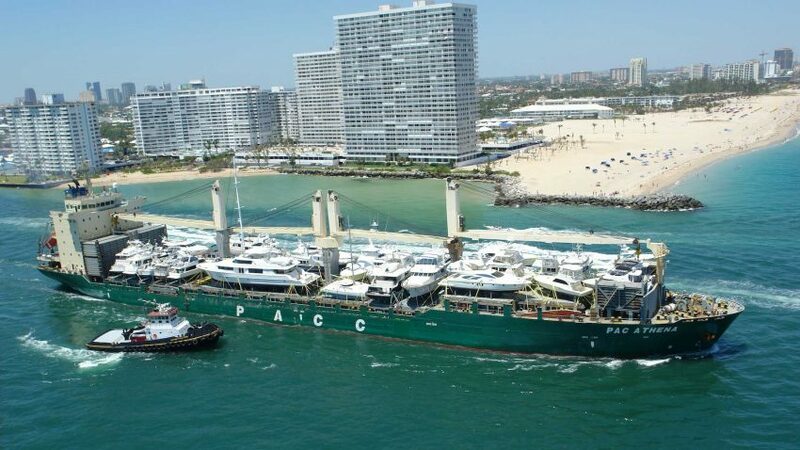 United Yacht Transport is a Fort Lauderdale based yacht shipping expert and the largest company of its kind. With extensive shipping services to any port around the world, the best reputation in the industry, and an extensive network of freighters including specialized heavy lift ships, there’s a yacht transport solution for boats of any size. Enjoy the greatest boat show on earth and know that United Yacht Transport is here to provide boat shipping estimates if you happen to leave the show with the title to a brand-new yacht.